First comparison photos of black and white 4.7-inch iPhone 6 screen glass. The above photo shows a comparison of the size between the 4.7-inch display and the 4-inch screen on the iPhone 5s/5c/5. We previously posted images of 5.5-inch iPhone screen backlighting components. The images do not indicate any breakthrough new features for the next-generation iPhone, but the availability of these parts indicates that the new iPhone is nearing mass-production ahead of a launch this fall. A new hole appears to the left of the ear speaker, but it is unclear if this is a re-located FaceTime front camera or a proximity sensor. The variation in port location from part-to-part could be due to production of parts still being in early stages. It is possible some pieces were produced earlier or later than others. The edges also appear to be slightly curved. In addition to a bigger screen, the new iPhones will include a thiner and rounder metal case, new sensors, improved cameras, and a more efficient A8 processor. A sapphire crystal display coverhas also been rumored for the larger-screened version. 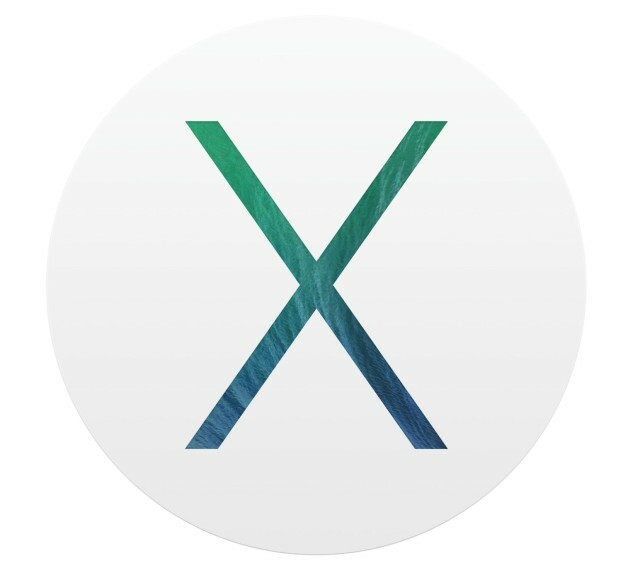 OS X Mavericks 10.9.4 fixes a super annoying WiFi bug. Right on the heels of iOS 7.1.2, Apple has released an update to OS X Mavericks in the Mac App Store. 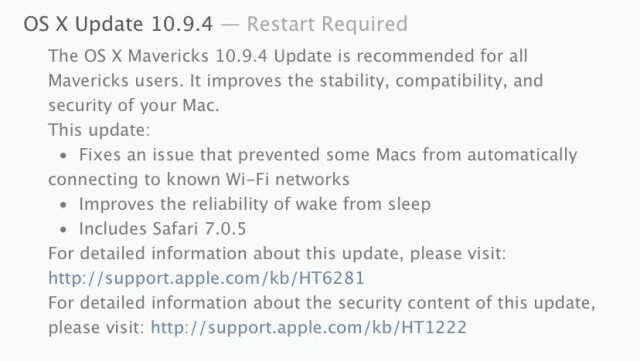 Version 10.9.4 of Mavericks features a fix for a bug many have been experiencing related to WiFi connectivity. There has been a known issue in OS X that keeps some Macs from automatically connecting to WiFi after being woken up from sleep. Apple has addressed the issue in 10.9.4 along with general reliability improvements for waking from sleep. Safari 7.0.5 is also included. I’ve been dealing with the WiFi problem on my Retina MacBook Pro for a long time. Whenever my Mac is woken up from sleep, I have to manually connect to my WiFi network instead of it automatically connecting like it’s supposed to. I’m glad to see that I’m not alone and that Apple has finally fixed the problem. OS X Yosemite is launching in the fall with a new design and a ton of new features. Those of us still waiting on Mavericks should head on over to the Mac App Store and install today’s update ASAP. Apple’s annual Back to School promotion to start tomorrow. As we reported two weeks ago, Apple’s annual Back to School promotion will begin tomorrow, according to sources. The program will be similar to last year’s offering, which provided $100 Mac App Store gift cards alongside Mac purchases and $50 cards with iPhone and iPad purchases. Apple will be re-decorating its stores overnight with a new education theme to go along with the new promotion. Earlier today, Apple unveiled upcoming iTunes U updates for the iPad, and the timing seems like anything but a coincidence. Siri may have helped this 2-year-old girl save her mother’s life. Siri. You love her or hate her. For many of us, Siri is a novelty at best, and an inconvenience at worst: the annoying voice who starts asking you what you want from your back pocket when you accidentally sit on your iPhone. But for those who love Siri, she can be a lifesaver … literally. Because Siri may have just helped a 2-year-old save her mother’s life. Liz Neaton of Montrose, Minnesota, has a nervous disorder that causes her to have fainting spells on occasion when she stands up. She’s also the mother of Eve, a smart 2-year-old girl who Liz trained to use Siri to call 911 in case of emergency. That little act of foresight paid off big time last week, when Neaton had a fainting spell and only her daughter was around to help her. Remembering what her mother had taught her, Eve picked up her iPhone, pushed and held the home button to call up Siri, then used the voice assistant to make an emergency call. I think scenarios like this show the real use of Siri, and why it’s a fantastic addition to Apple’s line of services. 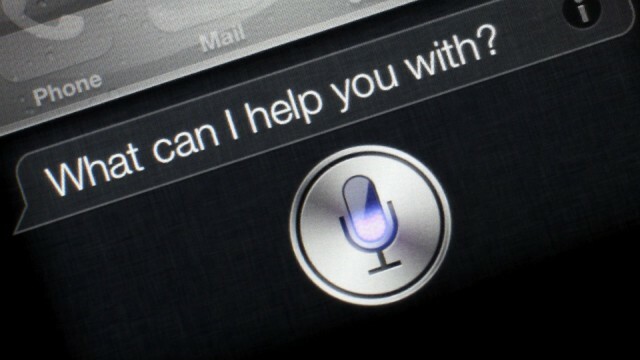 Siri is useful to the rest of us in many different scenarios, sure, but what Siri does is make using an iPhone accessible to everyone, from the elderly to the preverbal. It may not be the perfect user interface, but it is the most intuitive and easy-to-understand one. Facebook ran secret psychological experiments on users. A report from a team at Facebook that was first published in a scientific journal earlier this month reveals that the social network ran secret psychological experiments on 600,000 users without their awareness. When positive expressions were reduced, people produced fewer positive posts and more negative posts; when negative expressions were reduced, the opposite pattern occurred. These results indicate that emotions expressed by others on Facebook influence our own emotions, constituting experimental evidence for massive-scale contagion via social networks. Facebook’s Data Use Policy does give the company broad access to conduct these kinds of experiments, stating that users agree to “data analysis, testing, research and service improvement” when they sign up to use the social network. The paper does state that a machine was used to handle this experiment and no personal data from those 600,000 users was accessed. Free Sleep Sounds – get some shut-eye or relax with this free app. Free Sleep Sounds (free!) joins a pretty crowded field of apps designed to help you sleep, relax or meditate. 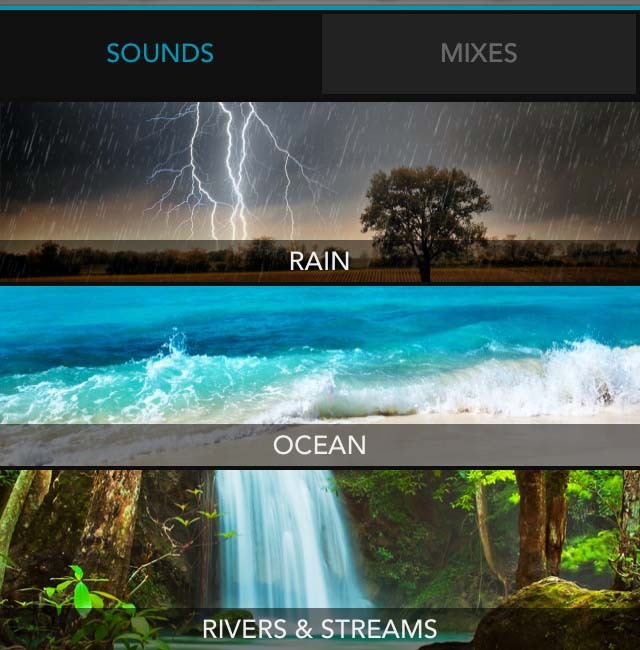 The app contains 25 well-recorded environments in stereo in categories like Ocean, Rivers and Streams, Wind, Fire, Birds and more. A unique feature is the ability to created blended mixes of any of up to six tracks, so you could hear wind along with the crickets. The app can run in the background. Free Sleep Sounds also shows you some nice images taken around the world to accompany the sounds. There is a sleep timer, and the tracks nicely fade out so they are not jarring. I tried Free Sleep Sounds with headphones as well as on a Bluetooth Stereo speaker, and found the audio quality quite good. Using this ad-supported app is easy enough, but it has the most intrusive and obnoxious ad placement I have seen in years. The screen bounces with notifications, and many of the ads are animated and distracting. It is the LAST thing I would want to see in an app designed to help me relax. If you look at the screen at all, anxiety replaces any soothing effects the soundscapes are designed to create. At times I wanted to throw my iPhone out the nearest window. The same developer offers a paid app that is actually a pretty good deal. While it is on sale for US$0.99, Sleep Sounds HQ offers more than 600 relaxing sounds. Some of the categories are a bit weird, like Industrial and Trains; not the kinds of soundscapes I would think of first if I needed to get some rest. Still, there is so much to choose from and the lack of ads makes Sleep Sounds HQ seem the better deal. My favorite sleep/relaxation app is still Naturespace. It’s a free app with a lot of in-app purchases, but the audio is first rate, and the free version has some great soundscapes. Naturespace is designed for headphone listening and has special settings for earbud listeners, but it sounds fine over external speakers. Sleep Sounds and Naturespace both provide natural sounds, which I prefer to synthesized soundscapes. Free Sleep Sounds requires iOS 6 or later. It’s not universal, and it is optimized for the iPhone 5. This gold Putin edition iPhone 5s will set you back a cool $4,360. 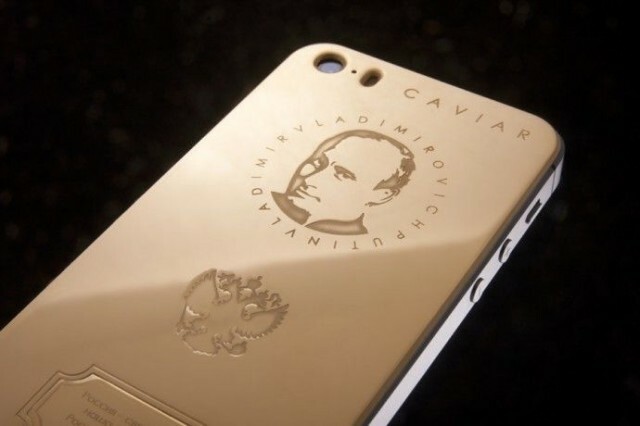 Unless someone’s *ahem* Putin us on, this 18-carat gold plated iPhone 5s featuring the visage of Russia’s controversial president is currently selling for around $4,363. Called the Caviar iPhone 5s Supremo Putin, it is the work of luxury jewellery house Perla Penna, and is available only in Russia. In addition to an etching of Vladimir Putin, the phone case is accompanied by the Russian coat of arms, along with the first two lines of the Russian national anthem. Putin is the latest in a series of iconic figures to wind up as etchings on luxury Perla Penna iPhones — with previous choices including Leonardo de Vinci, Mohammed Ali, and Steve Jobs. Of course, given that the iPhone 6 is on its way, one wonders about the logic of shelling out more than $4,000 for a soon-to-be-superceded iPhone. Unless the Putin iPhone 5s decides to run another term that is.